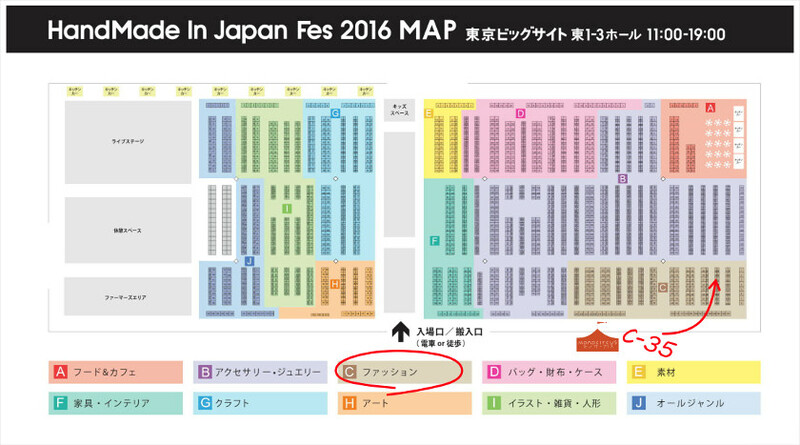 On July 23rd and 24th, Monocircus will be partcipating at the Handmade in Japan Fes 2016 held at the Tokyo Big Sight. The event is one of the grandest handmade market with over 5000 booths. Monocircus will be presenting most of its collection, plus a few new creations and colors, so do try to pop by! Monocircus will be presenting most of its collection, plus a few new creations and colors. And with our ongoing Summer Sale at Monocircus, we will be offering 15% discount also at the event! So do not miss it! We are definitely looking forward to seeing you there! here is a map of the hall. The event is to be held at the East Hall 1 – 3, and over this extensive space, there are categories A to J.
Monocircus' booth is at C-35. The C area is for the Fashion items which is at the right and frontal side of the Hall as you walk through the main entrance. Handmade in Japan Fes 2016 also features music performances, workshops and also sells foods! It is a great opportunity to shop and find items that you won't get to see elsewhere! As the event title implies, it is a Festival which is going to be full of activities and fun! So come join us!